This post was not written by an unbiased party when it comes to train travel. I love trains. I’ve been riding Amtrak since the 1990s, and I’ve been on nearly every scenic train in Colorado. 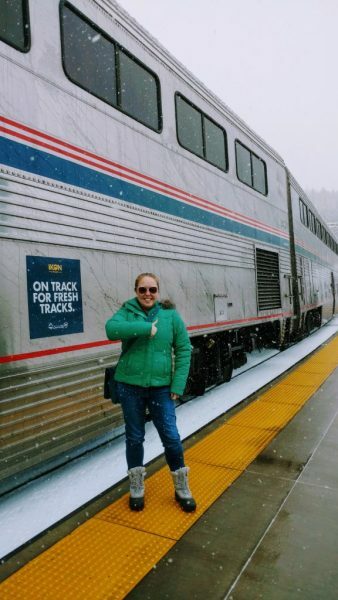 Train travel is something I think everyone should experience at least once, and the ski train is a fun and easy way to make this happen with Amtrak, a company that’s been running trains all over the country since 1971. The ski train ran between Denver and Winter Park Resort from 1940 to 2009, and it started running again, operated by Amtrak, in 2017. Ryan and I hadn’t been on the train since the mid-2000s when we boarded the train on a Friday morning after a good night’s rest at The Crawford Hotel inside Union Station. 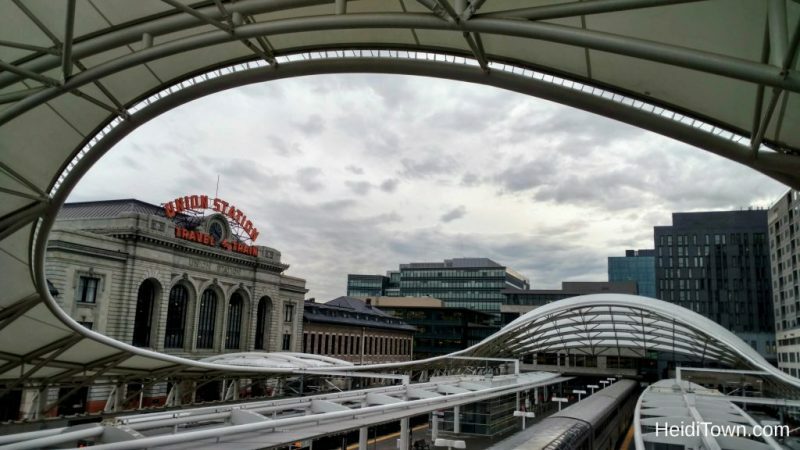 For some, especially those who live in Denver, the ski train may represent a logical way to get to the ski slopes during the ski season, but for us, it’s a part a ski vacation. We don’t live in the city and because we have to be at Union Station to catch the ski train at 6:30 a.m., it made since sense to stay at the hotel inside the station the night before we left for Winter Park. 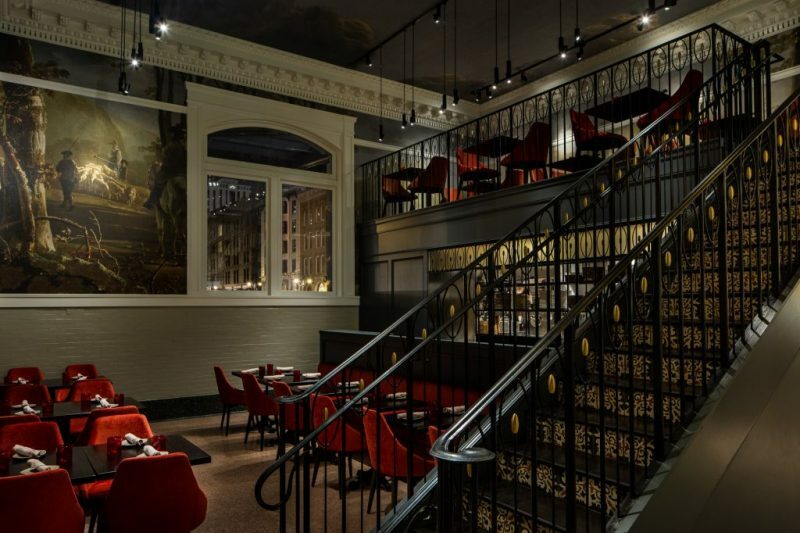 The Crawford, one of my favorite hotels in Denver, feels like a refurbished historic property that has modern day amenities. 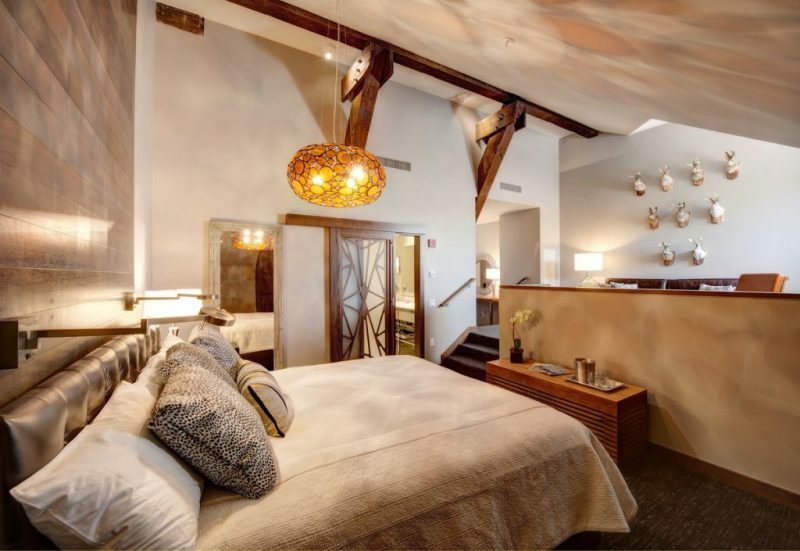 It truly must be experienced to be fully understood and a stay here is a must. Staying at The Crawford inside Union Station becomes part of the ski train experience. Thursday evening we had drinks at Cooper Lounge and dined at Ultreia, the newest restaurant at the train station venue. Our meal was unforgettable, as were the gin drinks, a perfect accompaniment to pickled carrots, in-house made sausages and more. Even the dessert, a traditional Portuguese custard tart was notably delicious. The Amtrak Winter Park Express, as it is officially called, runs from January 4 through March 31, 2019. It’s fondly referred to as the “ski train” in this article and by most people familiar with the route. Tickets are $39, $49 and $59, depending on availability and whether you are booking a round-trip fare or one-way. The train runs Saturdays and Sundays and the first two Fridays of each month. We were booked on a round-trip ticket that would arrive at Winter Park Resort on a Friday and return to Denver on Sunday in the late afternoon. The ski train departs Union Station at 7 a.m. arriving at Winter Park Resort at 9 a.m. In the afternoon, it departs Winter Park Resort at 4:30 p.m. and arrives at Union Station at 6:40 p.m. At Winter Park Resort, slopes close at 4 p.m. giving ski train day-trippers just enough time to scoot over to board the train before it leaves. This time table usually plays out accurately but the Amtrak Winter Park Express is a train and it’s subject to something I call “train time.” Freight trains have priority over Amtrak on the tracks and this can affect the timing of the train, as was the case on the morning we were on board. We were kept informed by the awesome Amtrak staff and our cabin hosts. On the way to Winter Park. we had hosts in each car that told us the history of the area and train and kept us updated on our progress. Our train was delayed not once but twice by two broken freight trains. Our conductor, Brad, said that it was the first time in 25 years that he’d seen two freight trains broke down on the same route. Of course, this happens while the media gal (me) is on board. However, I was already on train time and I love leaving the work of getting somewhere to someone else and if I’m late, so be it. By the way, the second delay was caused by a freight train that broke down inside the six-mile-long Moffat tunnel. The tunnel, which is 2800 feet underground, caused communication issues for the freight train, which was transporting coal. 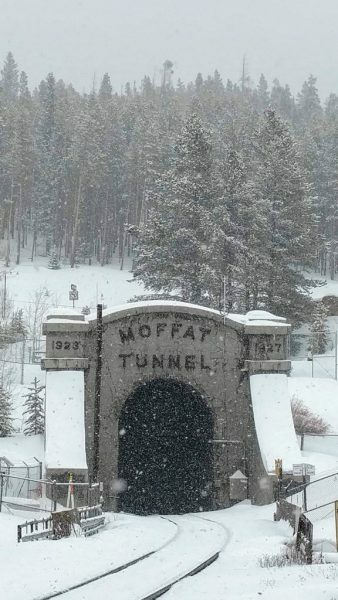 The ski train passes through Moffat Tunnel immediately before arriving at Winter Park Resort so there was no way to go around. Our train was three hours and 15 minutes late in Winter Park Resort, but everyone made the most of the situation. Brad, the conductor, ran a singalong in the lounge car, handing his guitar off to a train passenger when his voice gave out and other duties called. The snacks and beverage car, new this year, sold a lot of snacks and beer, definitely more than the average morning ski train sells. People sang, slept, played games and were generally happy despite the delay. The ski train ride is smooth and comfy and much more relaxing than flying or driving. There’s tons of legroom and nooks for all your things like purses and bags and in our case, even snowshoes. To my delight, there are plugs at each train seat where riders can charge their phones. Beware that cell coverage is sketchy throughout the ride because the route is remote and the train goes through a lot of tunnels. The seats extend into a lounge position that’s nearly flat, making napping a breeze. The windows allow riders to take in spectacular views of Denver and the Rocky Mountains. During our trip, snow was swirling outside and the world appeared as a winter wonderland, which made everyone even more giddy with anticipation about a good weekend of skiing ahead. The boarding and detraining process is simple. In fact, if you are going up and down in one day, you can leave all your stuff on the train and head directly to the slopes with your skis and gear. When the train pulls into Winter Park Resort, you’re super close to the new Gondola that will whisk you up the hill in five minutes. For those staying a few days, many of the hotel and condo properties have free shuttles that will transport you and your luggage to check-in. Our condo was at Zephyr Mountain Lodge and that process was ridiculously easy and after Sunday check-out, the lodge will hold your stuff until it’s time to board the train which is just a hop and skip away from the Zephyr Mountain Lodge. There’s a baggage car on the train where you deliver your bags and ski and ta-da, they reappear outside of the same car at the end of your journey. On the way back from Winter Park Resort, on Sunday, we made it to Union Station with four minutes to spare. Four minutes doesn’t make up for the long delay on Friday, but I loved being on the ski train, even for three hours and 15 minutes longer than normal. Like our conductor stated several times, it’s unusual for the ski train to experience this sort of extended delay, so your ski train will most likely be on time. I tried to find good online information on affordable ski train parking to no avail. Eventually, for cost-effective parking, my husband and I discovered that light rail was the best option for us. We had to park at the Westminster Station but parking for three nights and the 12-minute ride to and from Union Station cost us a total of $28. When compared to the valet rates at Union Station (around $45/day) we saved a lot of money. Parking at a light rail station for the ski train makes a lot of sense and didn’t add on that much travel time. 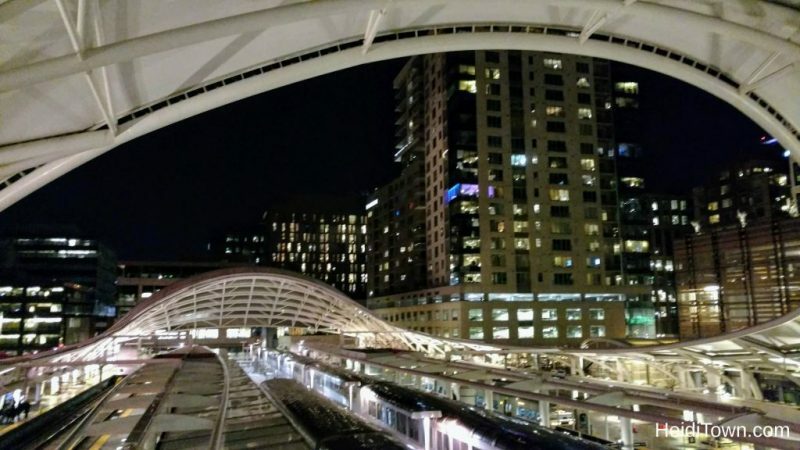 For a list of light rail stations visit RTD-Denver.com. Thank you to The Crawford Hotel and Winter Park Resort for hosting us on this trip. Love Brad! Just rode the chunnel from London to Paris. Love being able to go across states and countries without having to fly and all the hassles that come with it AND not having to rent a car at the destination. This Crawford-train-Zephyr combo sounds PERFECT!